A few weeks ago I was invited to a Francophone dinner at a friend’s place in a part of Söder I don’t know very well: the area around Vitabergsparken. It was a very nice dinner with a mix of French Canadians, French, Belgians and a few French speaking Swedes. I am not quite sure why I have not spent more time in that area. It is very nice and lively. It certainly does not look anything like the description of Vita Bergen from August Strindberg’s Red Room, where the poorest of the poor were living. It took me a while but I had spotted a nice café on my way to dinner that night and I finally made it there today. I had a hard time getting out of bed this morning. A bad night of sleep and typical Stockholm fall weather kept me under the blanket a bit longer than usual. While I thought I was a bit late to go out, I was quickly reminded that most shops in Södermalm only opens between 12:00 and 16:00 on Sundays. That did not give me much time to finalize a plan I have for my girlfriend’s birthday. The thing is that I offered her a few gifts with no reasons recently and it came to a point that she insisted that I give her no presents for her birthday. Not fair, if you ask me. And mostly impossible. At the same time, I also know that I have to accept her wishes. So the compromise (at least mine because she has not been part of that discussion) has been to offer her presents with minimal financial value. Well, this will not come as a surprise to most of you, but this is much harder than buying an expensive gift. Anyway, mission accomplished. At least on the shopping part of it. Now it’s time to implement the delivery plan. To be continued. Meanwhile, let’s get back to Café Pom & Flora. Café Pom & Flora is, in many ways, a typical Södermalm café. 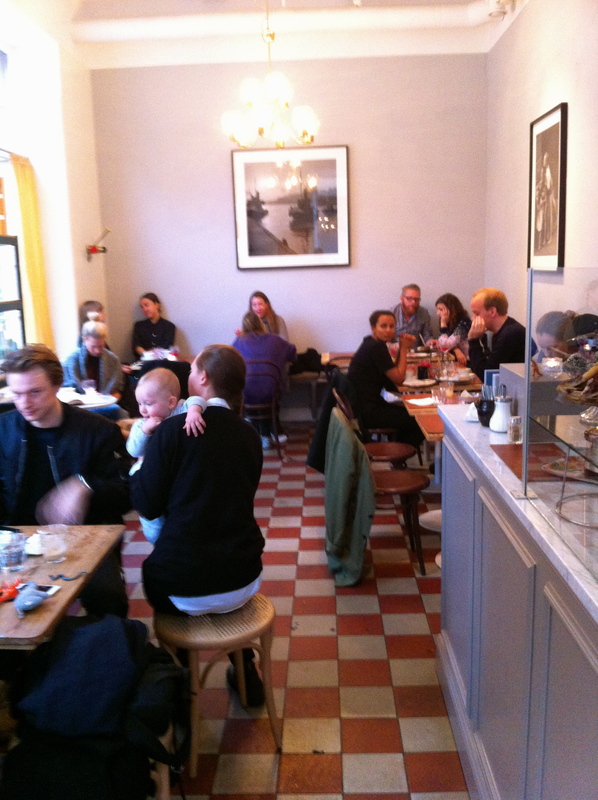 The crowd is a typical Södermalm crowd, with a mix of hipsters, new parents and hipster wannabes. 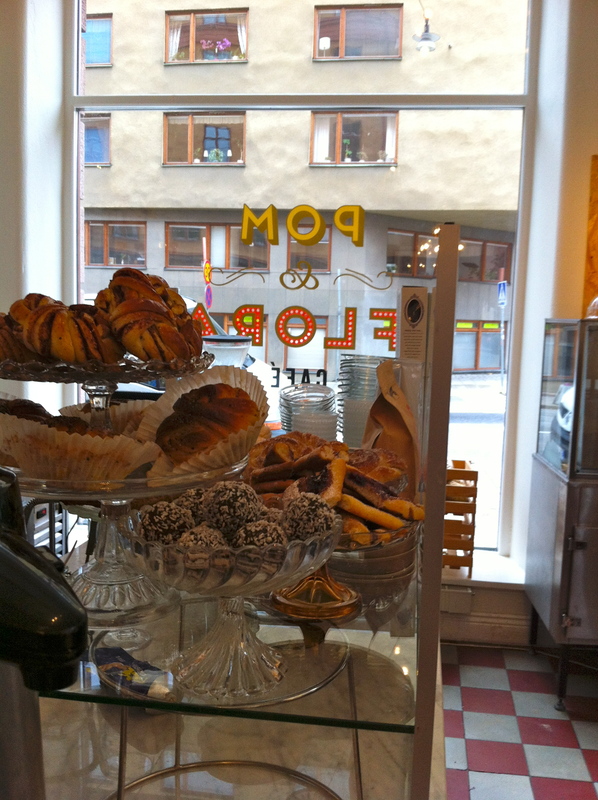 The coffee is good, the staff is friendly and, to my great pleasure, Café Pom & Flora also offers the Kardamumbulle. And it was delicious! Most people around me had ordered the full breakfast, which seems to include nice bread with jam, cheese, cold cuts and yoghurt. 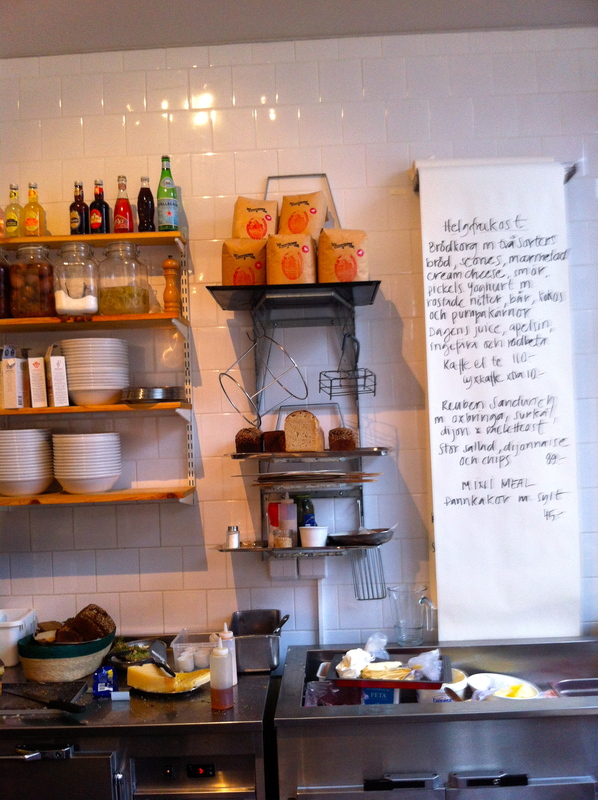 Another good reason to go back to Café Pom & Flora in the near future. Café Pom & Flora is rather small and I still think I was very fortunate to find a table today, even though the guy sitting next to me clearly thought that nobody should have taken the table next to him. It’s true that it was “cozy” but I don’t mind proximity in a café. 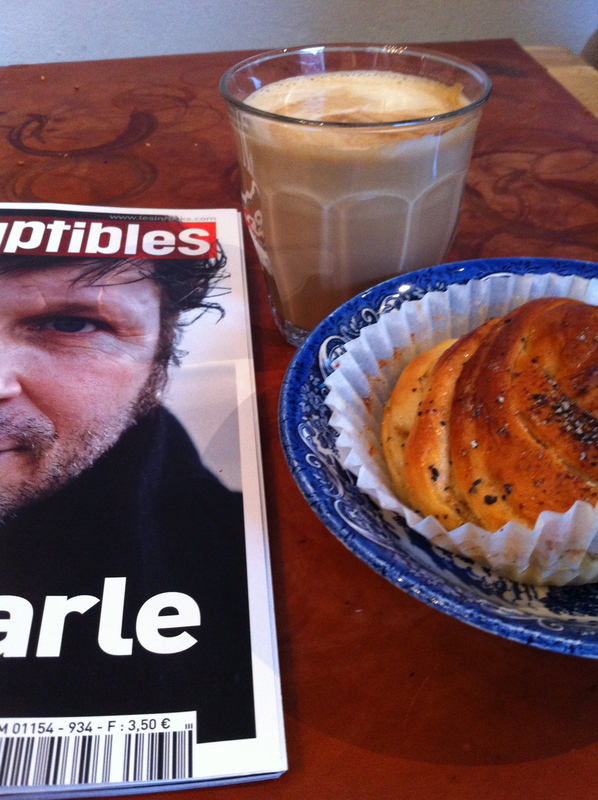 Beside, if one doesn’t want to sit too close to a stranger in a café, one should go to chains like Wayne’s coffee (probably the Swedish equivalent to Starbucks) and not to a small neighbourhood café. I’ve been rather slow on this blog in recent months. 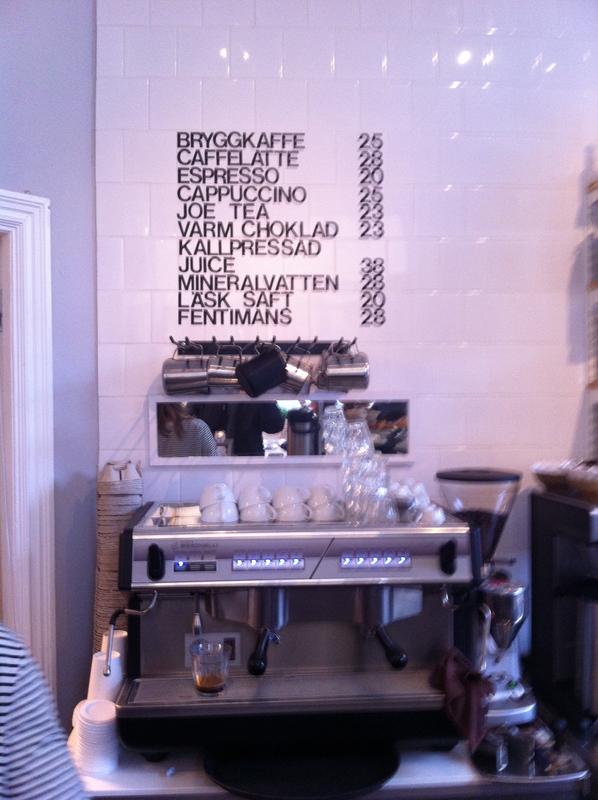 This is by no means because there is a lack of good cafés in Stockholm. It has, at least partly, to do with the fact that I tend to go back to the cafés I like. And I am afraid that with the addition of Café Pom & Flora to my list of cafés I like, the pace of new entries on the blog could get even slower! But I promise to make an effort to explore new cafés. Meanwhile, you can have a look at the menu!